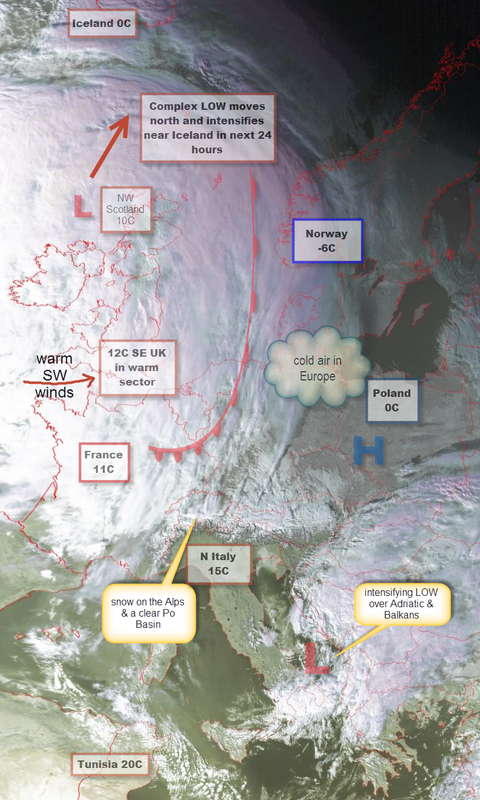 A snap-shot of weather today reveals how diverse and extreme and fascinating our European weather actually is! The east – west split is obvious: freezing temperatures on the continent with everywhere east of Germany below freezing. To the west we are bathed in warm balmy Atlantic air which is over 10°C. Northern Italy is enjoying almost spring-like weather in the Po Basin, possibly due to air sinking and warming from the Alps. Meanwhile, Iceland is due to be hammered by hurricane force winds over 76mph (>34m/s)with an intensifying LOW pressure bringing extremely high winds to the NW of the country on Saturday. This LOW pressure will have a central pressure of 942mb: which is extraordinarily low. Winds blow from HIGH to LOW pressure (albeit deflected to the right by the coriolis force – more later on this). The bigger the difference between HIGH and LOW pressure, the higher the winds. See the weather map below and spot the isobars placed close together over NW Iceland: this indicates ferocious Force 12 winds. The UK will be breezy, located on the edge of this LOW, but no where near as windy as Iceland, fortunately. Heads-up for a “heat-wave” in the UK next week :-)! !